Cardiff boss Russell Slade may only have two games left to save his job at the Championship club, says former Bluebirds captain Darren Purse. Slade's side are ninth in the table and lost 1-0 to League One Shrewsbury in the FA Cup on Sunday. 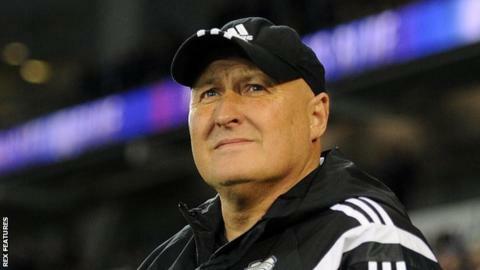 Manager Slade, 55, criticised his players after their third-round exit. BBC Radio Wales asked Purse how long Slade might last as manager in such circumstances. He replied: "I look at the next two games." Cardiff travel to third-placed Hull on Wednesday before a trip to in-form, 11th-placed Wolves on Saturday. Purse added: "I think the next two games are massive, massive games for Russell Slade and where Cardiff take their season. "They're two tough games, away from home. Cardiff's form away from home has been poor this season." Former Birmingham and Sheffield Wednesday defender Purse added: "Who knows what might happen after those games. "If they (Cardiff) don't pick up points from those games, they could be seven or eight points away from the play-offs and the season's over." Former Leyton Orient boss Slade has been in charge of Cardiff since October 2014.